What's the printer catridge number for a HP LaserJet P2055d? There are three different HP LaserJet P2055d cartridge numbers with different capacities including HP 05L (CE505L), HP 05A (CE505A) and HP 05X (CE505X). Will these cartridges fit my HP LaserJet P2055dn printer? Thanks, Sean. My HP LaserJet P2055D isn't printing. It makes ongoing grinding noises and is failing to pick up the paper? It's possible that your HP LaserJet P2055D printer would require a new transfer belt or paper pick up rollers to resolve this problem although we only currently have the LaserJet P2055D toner cartridges in stock. However, we would advise you to contact HP's support team or a printer engineer with this enquiry before ordering any replacement parts to ensure that you get the best technical advice. 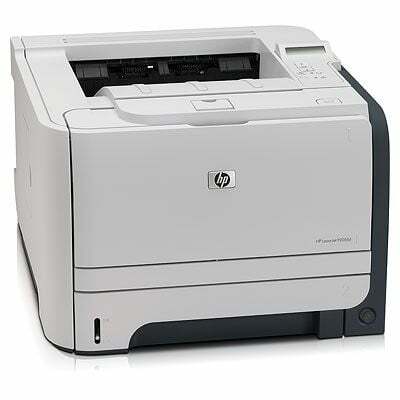 I have an HP LaserJet P2055D printer in the UK. I'm moving to the US. Will this work in the US with a 120 volt current (and a simple plug adapter)? If your HP LaserJet P2055D printer was purchased and used in the UK it should have a 220 - 240V power supply. However, in the US they use 110 - 120V power supplies so you may need some sort of converter for it to work. Please consult your printer manual or contact HP directly for further help with this enquiry. Also, please be aware that you must use cartridges with the corret region code in your printer and you might need to ask HP to change the region code if you're intending to use US cartridges which have different cartridge numbers to the ones we supply you with. Can you give me the Bangladeshi price of an HP LaserJet P2055D cartridge please? We can only deliver within the UK. Therefore, we only quote our prices in Pound Sterling. My printer is an Hewlett-Packard HP P2055 (as per the front of the machine). Is this the same as an HP P2055D? How can the HP LaserJet P2055D be used wirelessly? The HP Laserjet P2055D offers true 1200 dpi resolution monochrome printing at speeds of up to 33ppm. With a 600MHz processor and 64MB of internal memory there is plenty of power behind the Laserjet P2055D so you probably won't want to keep your productive office workhorse out of action for too long. If the cost of buying your replacements has left you a little short on cash there is a really simple solution to your problem. Here at Cartridge Save we make the cost of replacing HP Laserjet P2055D toner cartridges cheaper than ever before. If you are tired of paying inflated high street prices and want to find a discount on HP P2055D laser toners then look no further. We offer free next day delivery as standard on HP laserjet P 2055D toners to save you time any money. We are also confident that you will see excellent results when using our HP toner cartridges, so much so that we cover every single one of them with our cast iron money back guarantee. Our no quibbles return policy is effective for prior to your order just to make certain that you haven't received faulty or damaged goods. Place your order today by using our secure online checkout or alternatively please contact a member of our friendly support staff to register your order over the phone. With our range of benefits and award winning customer service you most definitely can't go wrong when buying HP Laserjet P2055D toner from Cartridge Save. The HP LaserJet P2055D laser printer is a black and white laser printer for users who need lots of prints, and need them quickly. It's a great option for business users who deal primarily in textual printing. Hewlett-Packard lives up to its strong reputation in the laser printing market with this monochromatic laser printer. While other printers claim to have "blazing fast" speeds of 12 or 18 pages per minute, the LaserJet P2055D manages to crank out an absolutely astounding 35 pages of black and white text per minute. And that's not just what HP claims on the side of the box, or on its website - it really does manage to print that quickly. And, another great thing about this printer is that its high speed does not reduce the quality of the prints it produces. Fonts were very dark and crisp with this printer, even at draft quality. Even the images it produced were relatively great quality despite their lack of colour. This HP model isn't without a few small annoyances, however. The included printing software, though easy to install and use, does have a peculiar quirk. Each print triggers a 'print notification' window that shows the status of the job on your computer's screen. One would expect this window to disappear once the job has completed, but it simply stays on the screen until it is closed by the user. For multiple print jobs, this can lead to a messy array of printing status windows that hinder productivity on the computer itself. It's also worth noting that the printer tends to crumple pages ever so slightly, which might be a concern for those who are printing official documents that need a professional, polished look. It's nothing that can't be solved by laying the documents fat for a few minutes, but it is a bit annoying. These minor drawbacks, however, cannot detract from the lightning speed at which the LaserJet P2055D prints black and white text. This is a quick, basic printer that is perfect for business or small office environments. It does support duplex printing, however, which is a great extra addition for power users who prefer not to waste paper. Users who have no need all the frills of a colour or multi-function laser printer simply will not find a better model than this one.